Iran's top military commander says despite its mainly peaceful defense doctrine, the Islamic Republic maintains powerful and categorical military presence in the region, warning certain regional countries against inviting the US to the Persian Gulf to hatch plots against Iran. 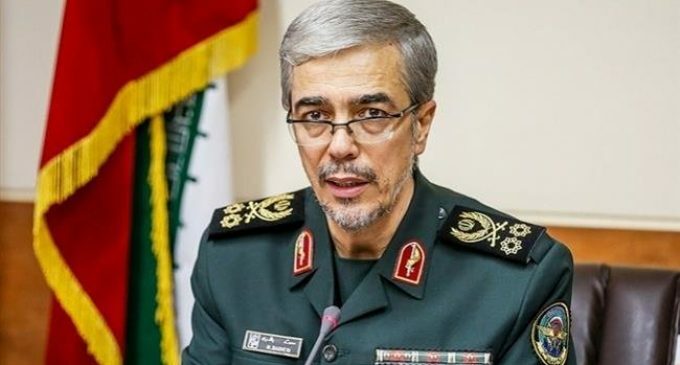 Chairman of the Chiefs of Staff of the Iranian Armed Forces Major General Mohammad Baqeri made the remarks on Monday while on a visit to the southern Iranian Persian Gulf island of Abu Mousa to inspect readiness of military forces and equipment deployed to the island. “Security in the Persian Gulf islands has been realized through the presence of the elite forces and use of the most modern military equipment,” Baqeri said. “Some [regional] countries must not pin their hope on America, because this very America was forced to leave Syria after several years of violence and spreading chaos there,” Baqeri said. The top Iranian military commander also noted that throughout its history, “the Islamic Republic of Iran has always been a pioneer of friendship and peace seeking, and even its military drills are held to convey this message,” he added. Baqeri concluded by saying that regional security could be only realized through cooperation of all regional countries while foreign presence in the region will prevent achievement of this goal. Baqeri’s remarks came after on Sunday, he slammed the US presence in the Persian Gulf region, noting that the presence of American forces only serve to fuel insecurity in the Persian Gulf. Iran's military chief says the US presence in the Persian Gulf only leads to more insecurity. He also downplayed US President Donald Trump's plan to withdraw troops from Syria, saying that Trump's decision was of no significance for defensive and security missions in the region. “The US exit from Syria was the humiliating withdrawal of a country that was present there without the consent and approval of the [Syrian] people and the legal government,” Baqeri added.